On July 1, 2013, Wendy Bemis a dog trainer at Michigan Dog Training LLC achieved a promotion to “Certified Dog Trainer.” She earned this distinction based upon her knowledge, skills and abilities in training dogs and their human companions and after having completed an intensive three-month training course with Michael Burkey, a professional dog trainer and President of Michigan Dog Training LLC in Plymouth, Michigan. Additionally, Bemis recently became an American Kennel Club Canine Good Citizen (CGC) Evaluator. Bemis has been a dog trainer since 2008. Prior to that, she served as a dog coordinator in a local rescue, served as a foster parent and volunteered in various shelters training dogs and preparing them for adoption. She enjoys spending her spare time traveling with her dogs, hiking, swimming and boating as well as attending dog training seminars. Her passion is to help families and their dogs meet the level of training needed so that they can enjoy their lives together. A well-adjusted and trained dog is able to go on family adventures and live a high quality life. Wendy knows this personally. 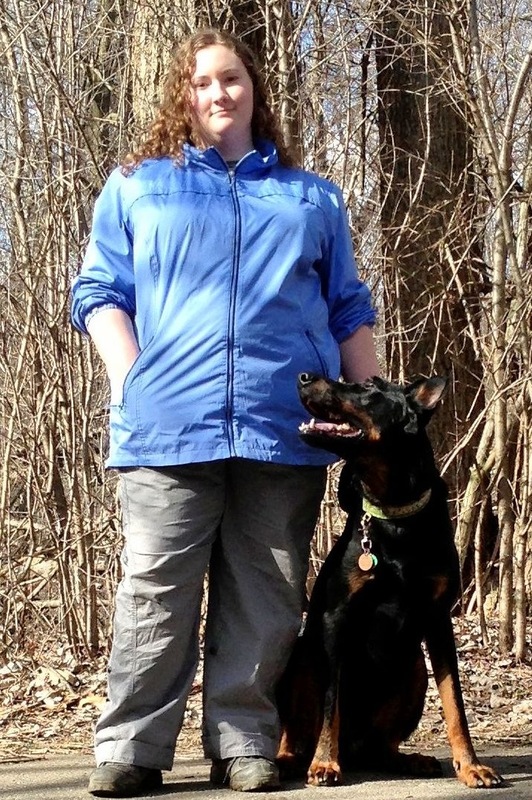 She successfully modified her own dog’s (Fleetwood, Beauceron) reactivity to other dogs enabling him to go more places with her such as group dog hikes, kayaking as well as earning a Championship Trick title and Rally title with first place finishes. She has a special interest in teaching puppy classes, advanced tricks, and providing solutions to behavior problems. Her personal dogs include: two certified therapy dogs, three Canine Good Citizen dogs as well as one titled in Rally Obedience and Championship Trick Dog. Her current dogs are: 1. Fleetwood Mes Yeux Vigilant, a Beauceron, CGC, TDI, NR, TDCH and trained shed antler dog; 2. Gina, a Dachshund, CGC, TDI; and 3. Adrian, an adorable deaf Toy Australian Shepherd. Her dogs who have passed over the rainbow bridge include: Archie, an All American mix, CGC, adopted at ten years of age; Scooter, a hound mix, adopted at 13 years of age; and Taz, a doberman mix adopted at eight years of age. Here is a link showing Wendy earning her Trick Dog Championship Title with her dog Fleetwood. Michigan Dog Training (MDT) LLC is proud to congratulate Bemis on her accomplishment. This entry was posted in Dog Training Profession, Uncategorized and tagged American Kennel Club, Canine Good Citizen, Certified Dog Trainer, CGC, dog training, Michigan, Michigan Dog Trainer, Michigan Dog Training, Plymouth, Wendy Bemis. Bookmark the permalink. Congratulations to Wendy from Kathy Wright and her BFF canine friend Cocoa, the very lively and sometimes challenging 6 month old chocolate lab who loves her very much.